Let’s change more dimensions of shapes. Which of these statements are true? Select all that apply. If $a$ is tripled, $m$ is tripled. If $a$, $b$, and $c$ are all tripled, then $m$ is tripled. If $a$ is tripled, $n$ is tripled. If $a$, $b$, and $c$ are all tripled, then $n$ is tripled. Create a true statement of your own about one of the equations. Clare sketches a rectangular prism with a height of 11 and a square base and labels the edges of the base $s$. She asks Han what he thinks will happen to the volume of the rectangular prism if she triples $s$. Han says the volume will be 9 times bigger. Is he right? Explain or show your reasoning. A cylinder can be constructed from a piece of paper by curling it so that you can glue together two opposite edges (the dashed edges in the figure). If you wanted to increase the volume inside the resulting cylinder, would it make more sense to double $x$, $y$, or does it not matter? If you wanted to increase the surface area of the resulting cylinder, would it make more sense to double $x$, $y$, or does it not matter? How would your answers to these questions change if we made a cylinder by gluing together the solid lines instead of the dashed lines? There are many cones with a height of 7 units. Let $r$ represent the radius and $V$ represent the volume of these cones. Write an equation that expresses the relationship between $V$ and $r$. Use 3.14 as an approximation for $\pi$. Predict what will happen to the volume if you triple the value of $r$. What happens to the volume if you triple $r$? Where do you see this in the graph? How can you see it algebraically? 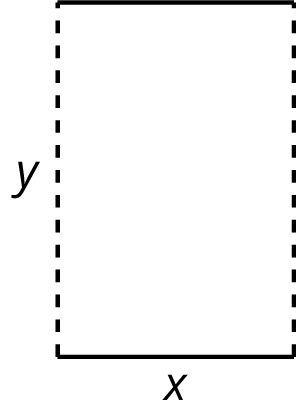 What happens if we scale two dimensions of a prism by a factor of $a$? In this case, the volume gets multiplied by a factor of $a$ twice, or $a^2$. For example, think about a prism with a length of 4 units, width of 5 units, and height of 6 units. Its volume is 120 cubic units since $4 \boldcdot 5 \boldcdot 6=120$. Now imagine the length and width each get scaled by a factor of $a$, meaning the new prism has a length of $4a$, width of $5a$, and a height of 6. The new volume is $120a^2$ cubic units since $4a\boldcdot 5a \boldcdot 6=120a^2$. A similar relationship holds for cylinders. Think of a cylinder with a height of 6 and a radius of 5. The volume would be $150\pi$ cubic units since $\pi \boldcdot 5^2 \boldcdot 6 = 150 \pi$. Now, imagine the radius is scaled by a factor of $a$. Then the new volume is $\pi \boldcdot (5a)^2 \boldcdot 6 = \pi \boldcdot 25a^2 \boldcdot 6 $ or $150a^2 \pi$ cubic units. So scaling the radius by a factor of $a$ has the effect of multiplying the volume by $a^2$! Why does the volume multiply by $a^2$ when only the radius changes? This makes sense if we imagine how scaling the radius changes the base area of the cylinder. As the radius increases, the base area gets larger in two dimensions (the circle gets wider and also taller), while the third dimension of the cylinder, height, stays the same.